Not only he is the son of culinary legend Larry Forgione, who revolutionized American-style cooking in the 1970s and '80s at An American Place in St. Louis, but Marc Forgione also is America's newest Iron Chef, having won season three of The Food Network's "Next Iron Chef" competition. The hard-won title is only the latest notch in his belt, however, as Chef Forgione has had an impressive career. A graduate of the University of Massachusetts at Amherst, he's worked for such notable restaurants as Above in New York, where he worked with acclaimed chef Kazuto Matsusake; An American Place, where he worked with his father; New York's AZ and Pazo, where he worked under noted industry luminary Patricia Yeo; and BLT Steak, also in New York, where he was sous chef for Laurent Tourondel. Later, Chef Forgione's hard work paid off, as he was named chef de cuisine at BLT Prime, and ultimately promoted to corporate chef of the BLT Restaurant Group. American is not the only cuisine Forgione is familiar with, however, as he has worked abroad for a number of French restaurants, learning the nuances of classic French techniques at Eugenie les Gains, Les Pres D'Eugeneis, Ferme aux Grieves and Le Cuisine Minceur. 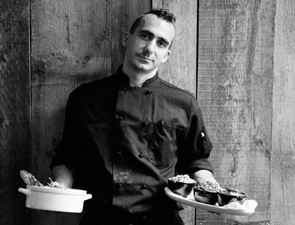 Today, he's got his second consecutive Michelin star in the 2011 guide for his own restaurant, Marc Forgione, which makes him the youngest American-born chef and honoree to receive a Michelin star in consecutive years. 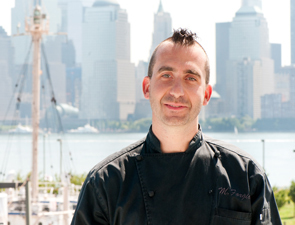 Fresh off his "Next Iron Chef" win, Chef Forgione recently spoke with TravelsinTaste.com, giving us a behind-the-scenes look at TV's toughest culinary competition. TravelsinTaste.com: We're amazed how everyone finishes on time in each of the "Next Iron Chef" challenges. How do you keep the proper sequence in your many tasks, and stay so focused? Do you have any tricks? Forgione: First off, you have to have a mental plan going in. Second off, you just can't make a mistake. And if you do make a mistake, you can't dwell on it. You have to have amnesia, and you have to keep going. There were definitely a lot of things, maybe not complete dishes, but a lot of things that did not make it onto the plate. I can't speak for everyone else; I can just speak for myself. On the buffet challenge [Episode 6: Inspiration Chairman's Challenge], in particular, there were two garnishes that didn't make it onto my buffet. With the potato battle [Episode 5: Respect Secret Ingredient Challenge], I definitely didn't finish what I wanted to do, and I know there were a number of other things from other chefs, too. It's also part of what we do. We had to adjust and get something that was worthwhile on the plate. TravelsinTaste.com: We didn't realize that; it looked like you did exactly what you wanted on your plate. Forgione: You have to pretend. You have to be confident in your story.